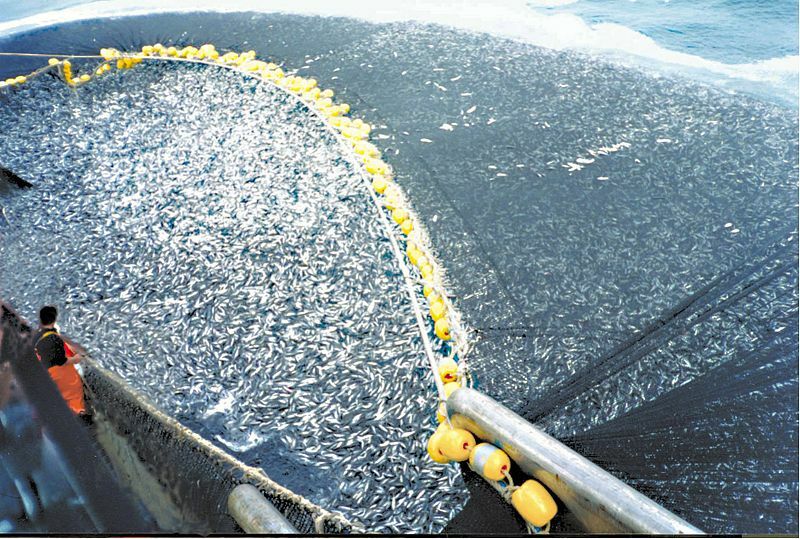 About 400 tons of jack mackerel (Trachurus murphyi) are caught by a Chilean purse seiner. When we talk about sustainable seafood these days, we’re mostly concerned with whether a population is being overfished. According to the United Nations’ 2012 “State of World Fisheries and Aquaculture” report, about 85 percent of the world’s fish stocks are fully or overexploited, depleted or recovering from depletion. We no longer take it as a given that there are plenty of fish in the sea, and some go so far as to suggest that our generation may be the last to enjoy seafood. The creators of consumer guides to sustainable seafood, of which there are now many, pay careful attention to overfishing. They also look at whether the methods used to catch fish are harming the aquatic habitat, and if they cause a lot of bycatch – the inadvertent snaring of unwanted fish, dolphins and sea turtles. Some of the guides investigate whether fisheries are well-managed. Other factors, like how suppliers deal with waste and whether they use harmful chemicals, are often taken into consideration as well. But in many cases, providing enough information for the consumer to make a truly informed decision is next to impossible. For instance, while there’s a clear distinction between Pacific and Atlantic salmon – Atlantic is always farmed and thus, always bad – whether my Monterey Bay app categorizes my Pacific salmon as a “best choice” or a more cautious “good alternative” depends on how it was caught. There’s really no way, said Safina, for me, or even the restaurant or supermarket I’m purchasing my fish from, to know that. I wasn’t able to get in touch with the Monterey Bay Aquarium to talk about the way in which they see their guide’s ultimate utility. However, I noticed an extra “consumer note” attached to its entries on salmon. “Buyer beware!” it reads. “Different species of salmon are sold under many market names – and several are available from farmed and wild sources.” Wild and farmed salmon, said Fitzgerald, are among the most commonly mislabeled products. Call a fillet “wild,” after all, and you can sell it at a premium. “You can’t rely on anybody selling you fish to be truthful 100 percent of the time,” Safina said. This isn’t limited to how the fish are caught; the sustainable option you pick might not be sustainable at all, because it’s an entirely different fish. It’s not that it isn’t possible (though I have my doubts given the overwhelming global demand for fish). It’s more that our knowledge and understanding of how fish gets to the plate is limited, or even obscured by the fishing industry. Just as more reporting and more investigation led to a better understanding of the depredations and environmental and health costs of Big Meat, the more we dig into where fish comes from and how it is fished the less appealing or sustainable it appears. The scientific study published in Agricultural Sciences by a scientist of Ireland’s Marine Institute, which, it has been claimed, justified the salmon fishing industry’s stance that a mere 1%-2% of wild salmon deaths are due to sea lice, has been challenged in a key publication. A recent critique by scientists from Scotland, Canada and Norway and led by Martin Krkosek of the University of Toronto’s department of ecology and evolutionary biology, published in the Journal of Fish Diseases, argues that the Marine Institute’s work has “fundamental errors”. Hughie Campbell Adamson, chairman of the Salmon and Trout Association Scotland (S&TAS) is now demanding that the Scottish Salmon Producers’ Organisation (SSPO) retract a statement made by its chairman, Professor Phil Thomas, six months ago dismissing the impact of sea lice on wild salmon. The new interpretation of the research claims there are “grave mistakes in measuring control and treatment groups, leading to wide inaccuracies”. The fresh examination of the original data shows that the impact of sea lice on wild salmon causes a far higher loss (34%) of those returning to Irish rivers than the 1% loss that was calculated in the original paper. Many scientists and environmentalists have been looking to aquaculture — fish farming — as a potential savior for today’s radically diminished wild-fish stocks. Indeed, aquaculture in the crucial Mexican states of Sinaloa and Sonora has doubled every few years over the past decade. In Harper’s, I pointed out that farmed salmon, shrimp, and tuna require massive amounts of fishmeal, which is usually harvested from wild populations. The recent news displays another problem that I didn’t mention, but that is equally problematic: cramming thirty shrimp into one square meter is a little like putting thousands of people into unsanitary prison camps. Disease runs rampant. Traditionally, there are several ways to address this issue, none of them ideal. The first is simply to desert the ponds as soon as diseases appear, then build a new one instead. This practice is common in Southeast Asia, and it occasionally happens in the mangrove forests of Nayarit and Sinaloa, too. But La Borbolla, one of the most environmentally sensitive farms in the regions, isn’t built on destroyed mangroves, and it isn’t easily moved. Instead, Mexican farms tend to rely on antibiotics, administered via fishmeal. But disease adapts quickly to antibiotics, and it’s a constant struggle to keep producing drugs that can combat the diseases. Twenty years ago, 80 percent of shrimp consumed here came from domestic wild fisheries, with imports supplying the rest. Today, we’ve more than flipped those numbers: the United States imports 90 percent of the shrimp consumed here. We now bring in a staggering 1.2 billion pounds of it annually, mainly from farms in Asia. Between 1995 and 2008, the inflation-adjusted price of wild-caught Gulf shrimp plunged 30 percent. Lest anyone think otherwise, these factory farms generate poverty in the nations that house them, as Grescoe demonstrates; they privatize and cut down highly productive mangrove forests that once sustained fishing communities, leaving fetid dead zones in their wake. And now, a new study from University of Oregon researcher J. Boone Kauffman findsthat the flattening of Southeast Asian mangrove forests is devastating in another way, too, and not just for the people who have been sustainably living in them for generations. Mangroves, it turns out, are rich stores of biodiversity and also of carbon—and when they’re cleared for farming, that carbon enters the atmosphere as climate-warming gas. Kaufman estimates that 50 to 60 percent of shrimp farms occupy cleared mangroves, and the shrimp that emerges from them has a carbon footprint 10 times higher than the most notoriously climate-destroying foodstuff I’m aware of: beef from cows raised on cleared Amazon rainforest. Kaufman calls the shrimp-farming style that prevails in Asia “the equivalent of slash-and-burn agriculture,” because farm operators typically “only last for 5 years or so before the buildup of sludge in the ponds and the acid sulfate soil renders them unfit for shrimp,” hetold Science. Cheap shrimp, like cheap oil, is looking increasingly like a dangerous delusion. And until we know more, or we truly do find a sustainable fish-producing strategy, the right thing do do is simply not eat fish. Sorry, fish-lovers and pescatarians, by now we know enough to know that we need to know more. Thanks for this post. It highlights some of the challenges we face in responsibly harvesting, marketing and consuming fish, but, no, no, no… the answer is Not to stop eating fish. It is incumbent upon consumers to educate themselves – a feat not as difficult as you’re making it out to be. Take salmon: all species from Alaska and the west coast of the U.S. are wild-caught and are a good choice. It does not matter what harvest method was used. The SeaFood watch pamphlet cites possible fishing methods, but the pamphlet does not say to avoid any one method. What counts is that the fish are wild-caught. It is also not true that restaurants and retailers don’t have any way of assuring that the fish they serve were responsibly harvested. They have the capability of knowing what they are buying and from whom, and if they don’t they need to find a different supplier. The problem is that restaurants and retailers frequently Knowingly mislabel their fish products. That should be an crime. The FDA needs to start doing their job in this regard – just as they do for other food products. One of the best ways we can ensure that the wild environs salmon and other fish require remain clean and protected is to value the fish. People who value a good meal of responsibly harvested salmon are salmon’s best allies. On reading this Article I realise how ignorant I am as to the fishing practices and diseases of marine life. It sounds very depressing the world over and people will have to learn to realise the value of our Planet’s marine life and the fishing possibilities.for the future generations. Restaurants and fishmongers should arm themselves with all the latest news and articles available on certain fish available and be encouraged to do so for the prolonged life of any species. Fishermen, the World over, should abide by the Laws of Marine Life or be punished if damaging or overfishing any species in order to defend progeny of species..
What can we the General Public do to help the Defence of our Planet for the future of Marine Life. Unfortunately, unless the restaurant involved is a high-end one, chances are that they will buy what is “good enough.” This will usually involve purchasing at the cheaper end of the market, the provenance of the seafood may be as murky as the pools shrimp live in. Restaurants are notoriously risky investments and one way to minimise the risk of bankruptcy is to save as much money as possible on raw ingredients. They can print what they like on the menu to make it sound fabulous, but the bottom line is that it is not in their interest to pay over the odds for genuinely “wild” fish.